Lovely colors and blooms. Have a happy day! 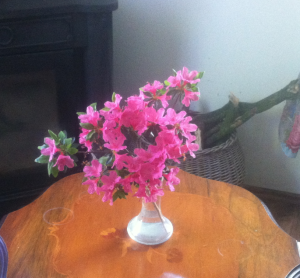 Flowers are pretty and would go well with those pink boots you have on in your profile picture! I'm from Kentucky and love boots! I have a red pair. Let's go to a hoe-down! Beautiful! Outdoors and indoors both! Very pretty flowers. What kind are they? So pretty! What type of plant is that, I wonder...? I'm embarassed to say I don't know what kind of flowers these are. I'm not very good when it comes to gardening. I can pull up weeds, and that's about it. Thank you for hosting this WW. Love your lilac bushes, they are one of my favorite flowers. 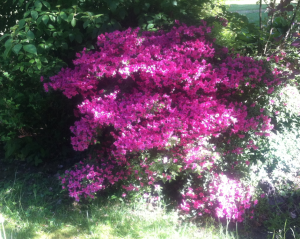 Ahhh, azaleas mean summer in the South! Thanks for joining us on Oh My Heartsie Girl Wordless Wednesday! Bringing a little bit of nature to the kitchen table. Those are beautiful. This year, I got one daffodil and 2 tulips. Sad. That's not very much Linda. I suppose I lucked out!